- Waterproof and breathable PUL diaper shell, helps keep skin dry and comfortable. - Simply place absorbent material in the pocket. Also compatible with all EcoAble Teen/Adult Cloth Diaper Inserts (sold separately). - Fully adjustable: adjust size with snap buttons for a perfect fit every time. Check your measurements before ordering! The diaper hip tabs adjust from 26 inches to 41 inches - measure yourself just below the top of your hip bones to determine if the diaper would be a good fit. Cloth Diaper Shell – outside: 100% PUL (Polyurethane Laminate); inside: 100% Microsuede. Do not place Microfiber insert next to the skin! Due to fast absorbing properties of the microfiber material, it may dry out your skin. 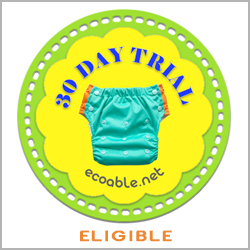 It is best to place Microfiber insert inside the diaper pocket or under another insert. Discreet Packaging: We know that when you make an order for adult cloth diapers you don't want everyone knowing about it! At EcoAble, every order you make is discretion assured – that means completely unmarked packaging.